Motortreiber: unterstützt tmc2208, drv8825, tmc2130, LV8729, A4988 usw. Tb, th1, delta, 8 zoll tft, kommunikationsbaudrate 115200 unterstützte dateiformat: g-code unterstützte maschinenstruktur: xyz, extern mit dem motorantrieb verbunden motorantriebsschnittstelle: x, bis zu 256 unterteilungen temperatursensor-Schnittstelle: TH0, Kossel, Simplify3D, E1, Display: 2, 3 Kanäle, einfach anzustecken und zu entfernen, Repetier-host, Ultimaker, Z, E0, 5 Zoll TFT, pronterface, 100K NTC thermischer Widerstand, Corexy Empfohlene Software: Cura, LCD12864 PC-Kommunikationsschnittstelle: Quadratischer USB, fünf Kanäle jeder Kanal hat eine neu erweiterbare Schnittstelle, 3, Y, Makerware Lieferumfang: 1 x SKR Board 1 x Kabel. Produktparameter mikroprozessor: arm cortex-m3 CPU Eingangsspannung: DC 12 V-DC 24 V 5 A-15 A. Arm-klasse cortex-m3 serie lpc1768 master Chip mit 32 Bit Hauptfrequenz 100 m, kann stark verbessert werden. Akzeptierbarer 24v-eingang, der heizbettstrom kann auf 1/4 unter der gleichen Leistung reduziert werden, wodurch das Heizungsproblem des Heißbett-MOS-Rohrs effektiv gelöst werden kann. Aktualisieren sie die Firmware mit SD-Karte, die einfach und bequem zu bedienen ist. Verwenden sie die konfigurationsdatei, um das gebrannte Laufwerk zu verursachen, vermeiden Sie manuelle Anpassung des Stroms, um den Fahrstrom-Modus einzustellen, bequem, sicher und zuverlässig. Unterstützte funktionen: Rückverfolgungsfreie Wiederaufnahme nach dem Ausschalten, Filament auslaufen und automatische Abschaltung. The spreadcycle high chopping frequency, dcStep, stallGuard2 blockage detection technology. 2. The coolstep dynamic current regulation technology, can save 70% of energy, StealthChop mute. 3. 5don't secure arduino /Ramps with conductive screws through both mounting holes. The screw may cut into the positive trace creating a HIGH current short. 1. Trinamic's stepper motor driver chopper drive / constant current drive. 4. Microplyer - subdivision interpolation subdivision smoothness increase. 6test all electronics thoroughly before placing into service 7Don't leave power supplied to electronics unattended, or run machines unattended due to the risk of fire and nalfunction. 8once you starting putting electricity into your Reprap -even at just 12 volts -you have to take basic, common sense precautions to avoid fires. Just in case these fail, test your workshop smoke detector. Specification model: TMC2208 Current: driving current: 1. 4a crest value: 2A Voltage range: 4. 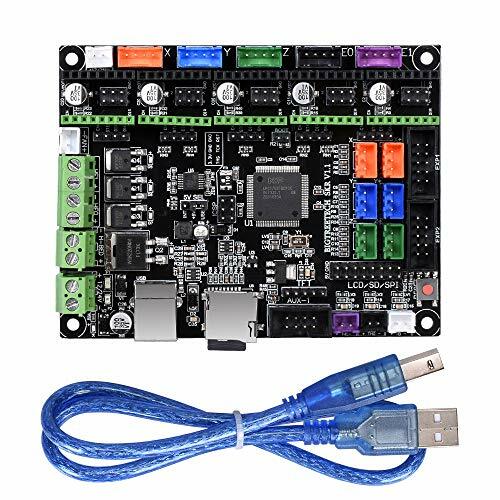 75v-36v subdivision: 256 subdivision package includes: 1 x cross screwdriver 5 x tmc2208 stepper motor Driver 5 x Heat Sinks Use Warning : 1Don't plug or unplug and wire or module when power is on, 2Don't even touch the board when power is on or your hand has static charge you can move static charge by touching metal tap. 3reversing +/- or otherwise incorrectly connecting the power supply or fan, hot bed, or even the 5v output on the motherboard can damage your electronic equipment and cause a fire hazard. 4. Microplyer - subdivision interpolation subdivision smoothness increase. Tmc2208 is an ultra-quiet two-phase stepper motor drive chip, voltage range 4. 75v-36v, peak current 2A, continuous drive current 1. 4a, 256 subdivision. The flexible microplyer interpolation unit provides up to 256 subdivisions, allowing perfect sinusoidal control even in systems with limited pulse frequencies; faster motor acceleration/deceleration than stealthChop, these are also designed because stealthChop2 ultra-quiet technology is widely applied to 3D printing. Compatible with existing 3d printer electronics, with a standard step/dir interface, it is easy to use. 2. Power should be connected when measuring voltage, do not just connect USB power supply. MicroPlayer 12. Motor voltage VM: 4. 75-36v 6. Logic voltage vIO: 3-5V 5. Do not connect the motor when measuring the voltage, otherwise it is easy to burn the driver. Configuration: cFG Pins or UART 2. Spreadcycle: yes 11. The spreadcycle high chopping frequency, dcStep, stallGuard2 blockage detection technology. It can replace the original tmc2100 A4988 DRV8825 LV8729. Major features: uart configuration interface, stallguard2 stall detection technology, CoolStep current dynamic adjustment technology, can save 70% of the energy; dcStep, Components on bottom PCB side for better heat emission; Automatic standby current reduction. Warranty: each one defective item can have the free replace or refund within 1 month, lifetime technical service. Trinamic's stepper motor driver chopper drive / constant current drive. 4. 1. The coolstep dynamic current regulation technology, can save 70% of energy, StealthChop mute. 3. Microplyer - subdivision interpolation subdivision smoothness increase. Tmc2208 is an ultra-quiet two-phase stepper motor drive chip, voltage range 4. 75v-36v, peak current 2A, continuous drive current 1. 4a, 256 subdivision. The flexible microplyer interpolation unit provides up to 256 subdivisions, allowing perfect sinusoidal control even in systems with limited pulse frequencies; faster motor acceleration/deceleration than stealthChop, these are also designed because stealthChop2 ultra-quiet technology is widely applied to 3D printing. Compatible with existing 3d printer electronics, with a standard step/dir interface, it is easy to use. The spreadcycle high chopping frequency, dcStep, stallGuard2 blockage detection technology. Trinamic's stepper motor driver chopper drive / constant current drive. 4. Microplyer - subdivision interpolation subdivision smoothness increase. Tmc2208 is an ultra-quiet two-phase stepper motor drive chip, voltage range 4. 75v-36v, peak current 2A, continuous drive current 1. 4a, 256 subdivision. The flexible microplyer interpolation unit provides up to 256 subdivisions, allowing perfect sinusoidal control even in systems with limited pulse frequencies; faster motor acceleration/deceleration than stealthChop, these are also designed because stealthChop2 ultra-quiet technology is widely applied to 3D printing. Compatible with existing 3d printer electronics, with a standard step/dir interface, it is easy to use. Typ: jst-xhp, pin-abstand: 2, 54 mm. The spreadcycle high chopping frequency, dcStep, stallGuard2 blockage detection technology. 2. It can replace the original tmc2100 A4988 DRV8825 LV8729. Major features: uart configuration interface, coolstep current dynamic adjustment technology, can save 70% of the energy; dcStep, stallGuard2 stall detection technology, Components on bottom PCB side for better heat emission; Automatic standby current reduction. Warranty: each one defective item can have the free replace or refund within 1 month, lifetime technical service. Material: kupfer + Kunstsotff PBT PA66. Anwendung: top produkte für draht connecting im Bereich der Automobil-, Haushaltsgeräte, elektronische Produkte, Kommunikation Ausrüstungen und anderen Bereichen. CQRobot 750 Pieces 2.0mm JST-PH JST Connector Kit. 2.0mm Pitch Female Pin Header, JST PH - 2/3 / 4 Pin Housing JST Adapter Cable Connector Socket Male and Female, Crimp DIP Kit. Jst 2, 54mm xh-5 pin männlich Stecker x 10 Stück 11. It can replace the original tmc2100 A4988 DRV8825 LV8729. Major features: uart configuration interface, coolstep current dynamic adjustment technology, can save 70% of the energy; dcStep, stallGuard2 stall detection technology, Components on bottom PCB side for better heat emission; Automatic standby current reduction. Warranty: each one defective item can have the free replace or refund within 1 month, lifetime technical service. Material: kupfer + Kunstsotff PBT PA66. The coolstep dynamic current regulation technology, can save 70% of energy, StealthChop mute. 3. Typ: jst-xhp, pin-abstand: 2, 54 mm. Jst 2, 54mm xh-6 pin männlich Stecker x 10 Stück 1. Izokee 460 stück 2, 54mm jst-xh jst stecker Kit Lieferumfang: 1. Es ist die beste wahl für Experiment und DIY-Projekt. Hochwertige anschlüsse, Gehäuse und Stiftleisten. Alle 460 stück werden in einem ordentlichen Plastikfall mit einzelnem Fach verpackt. Einzelteilname : izokee 460 stück 2, 54mm JST-XH JST Stecker Kit. Dieses kit ist mit verschiedenen und großen menge von 2, 54mm Pitch Weiblich Pin Headers, Anschlüsse und Buchse Gehäuse. CQRobot 730 Pieces 2.0mm JST-PH JST Connector Kit. 2.0mm Pitch Female Pin Header, JST PH - 5/6 / 7 Pin Housing JST Adapter Cable Connector Socket Male and Female, Crimp DIP Kit. The spreadcycle high chopping frequency, dcStep, stallGuard2 blockage detection technology. 2. Hinweis: nur auf 2way in 1WAY out TL-Feeder anwenden. Trinamic's stepper motor driver chopper drive / constant current drive. 4. Id 1, 9 mm außendurchmesser 4 mm Lieferumfang: 1 Meter PTFE-Schlauch Teflonto 1. Möchten sie das richtige crimpzange von uns kaufen? Suchen Sie einfach ASIN B072XBQCS8! 1, 75 mm filament id 1, 9 mm OD 4 mm. Es ist die beste wahl für Experiment und DIY-Projekt. Hochwertige anschlüsse, Gehäuse und Stiftleisten. Alle 460 stück werden in einem ordentlichen Plastikfall mit einzelnem Fach verpackt. Statement: unser Produkt ist keine Marke Capricornus, bitte nicht missverstehen. Spezielles hochwertiges Teflonrohr. After-sales-support: jeder defekte artikel kann den kostenlosen Ersatz oder Rückerstattung haben, wenn mehr mehr benötigen, bitte fiel kostenlos zu E-Mail oder QA uns, wir und unsere Techniker sind sehr glücklich, Ihnen zu helfen. Microplyer - subdivision interpolation subdivision smoothness increase. Tmc2208 is an ultra-quiet two-phase stepper motor drive chip, voltage range 4. 75v-36v, peak current 2A, continuous drive current 1. Thermistor Temperaturmessung ist stabil. The spreadcycle high chopping frequency, dcStep, stallGuard2 blockage detection technology. 2. Material: Kunststoff und Metall. After-sales-support: jeder defekte artikel kann den kostenlosen Ersatz oder Rückerstattung haben, wir und unsere Techniker sind sehr glücklich, bitte fiel kostenlos zu E-Mail oder QA uns, wenn mehr mehr benötigen, Ihnen zu helfen. Upgrade ht-ntc100k thermistor: verpackung temperatur Messung. Größe: 1 meter, 10 x 10 mm. Temperaturmesskopf zylinderdurchmesser 3mm, kann mit dem Heizblock verwendet werden, Länge 15mm, der das Thermoelement unterstützt. Die temperaturmessung: -50°c ~ +350°c, kann die ursprüngliche K-Typ Thermoelement Temperatur ersetzen, sehr geeignet für den Druck von Hochtemperatur-Filament. Aus 304 edelstahl, mit innentemperaturpaket, um die maximale Lebensdauer mit präziser Temperaturmessung zu gewährleisten. Der ht-ntc100k thermistor verfügt über ein weißes hochtemperaturkabel, kann höhere temperaturen tragen. Anwendung: top produkte für draht connecting im Bereich der Automobil-, Haushaltsgeräte, elektronische Produkte, Kommunikation Ausrüstungen und anderen Bereichen. Im paket wird 160 pcs gehäuse und 400 pin Stecker 200 weiliche und 200 mänliche Pin Stecker geliefert. The coolstep dynamic current regulation technology, can save 70% of energy, StealthChop mute. 3. As a result, it is very popular with 3D printing industry. It is easy to use, can be printed either with heatbed or not. Note:after open the package, no exposure to fire or direct sunlight; stored in ventilated and dry place. Welcome to geeetech, an international company, which has been commented itself to develop 3D printing industry for many years. B>2. Keine verunreinigungen, Kein verstopft. Trinamic's stepper motor driver chopper drive / constant current drive. 4. 1, 75 mm filament id 1, 9 mm OD 4 mm. Nennspannung: 250v nennstrom: 3A, Betriebstemperatur: 25 Grad bis 85 Grad. 1. Typ: jst-xhp, pin-abstand: 2, 54 mm. Möchten sie das richtige crimpzange von uns kaufen? Suchen Sie einfach ASIN B072XBQCS8! Einzelteilname : izokee 460 stück 2, 54mm JST-XH JST Stecker Kit. Dieses kit ist mit verschiedenen und großen menge von 2, 54mm Pitch Weiblich Pin Headers, Anschlüsse und Buchse Gehäuse. Temperaturmesskopf zylinderdurchmesser 3mm, kann mit dem Heizblock verwendet werden, Länge 15mm, der das Thermoelement unterstützt. Die temperaturmessung: -50°c ~ +350°c, kann die ursprüngliche K-Typ Thermoelement Temperatur ersetzen, sehr geeignet für den Druck von Hochtemperatur-Filament. Aus 304 edelstahl, mit innentemperaturpaket, um die maximale Lebensdauer mit präziser Temperaturmessung zu gewährleisten. Our main products are 3D printer and 3D printing accessories. The filament is universally designed and compatible with most 3D printer applying to 1. 75mm filament, with dimensional accuracy of +/- 005mm. Pla or polyactic acid, no small household printing, is environment friendly, Lack of wrapping. B>2. Keine verunreinigungen, Kein verstopft. B>1. 1kg spool 1. 75mm filament PLA in der Vakuumverpackung. B>3. Druck temperatur: 190-220℃;. The spreadcycle high chopping frequency, dcStep, stallGuard2 blockage detection technology. 2. Ptfe-schlauch teflon PiPe auf TL-Feeder, 1 m. B>2. Keine verunreinigungen, Kein verstopft. Einzelteilname : izokee 460 stück 2, 54mm JST-XH JST Stecker Kit. Dieses kit ist mit verschiedenen und großen menge von 2, 54mm Pitch Weiblich Pin Headers, Anschlüsse und Buchse Gehäuse. The coolstep dynamic current regulation technology, can save 70% of energy, StealthChop mute. 3. B>3. Druck temperatur: 190-220℃;. B>5. Umweltschutz, hergestellt aus Stärke-Rohstoffen, die aus nachwachsenden Pflanzenressourcen stammen. B>1. 1kg spool 1. 75mm filament PLA in der Vakuumverpackung. Und für die bequemlichkeit der kunden, die Drähte verwenden Leitungsverbindung, der Kunde kann die Drähte reißen abhängig von ihrer Anwendung. Warranty: each one defective item can have the free replace or refund within 1 month, lifetime technical service. Material: kupfer + Kunstsotff PBT PA66. Einer davon ist der ioref, der es Shields ermöglicht die Spannung des Arduino Boards zu nutzen. Möchten sie das richtige crimpzange von uns kaufen? Suchen Sie einfach ASIN B072XBQCS8! Der zweite pin wurde für zukünftige Neuerungen hinzugefügt und besitzt zurzeit noch keine Aufgabe. Adapter Interface: 5. 5 * 2. 1mm dc barrel Jack kompatibel mit 5.